With the Sun in Taurus (security and stability) and the Moon in Capricorn (achievement and wealth), today and tomorrow are Nine of Coins days. 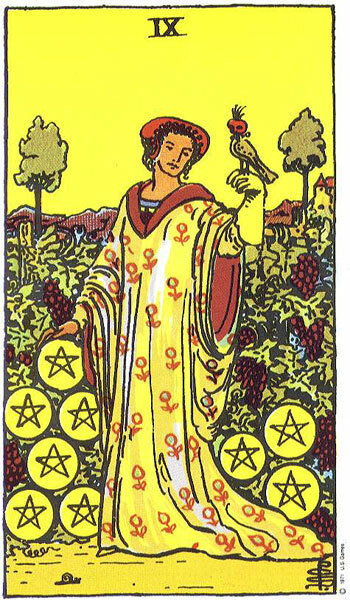 The Nine of Coins is a glorious card – appealing on so many levels. The woman here depicted, is completely at one with nature, her garden having produced an abundance of luscious purple grapes and shiny gold coins. On her hand, rests a falcon–the wild, progressive energy of the hunt – in control and at her command. At her feet, crawls a tiny snail – the slow, steady progress (snail’s pace) that realised her goals. In the distance, is her sprawling manor house, secure and well maintained. So could be wrong with this picture? Well, the woman does have only her animals for company. I’ll bet she gets lonely for human contact once and awhile – don’t you? This is the downside of the Nine of Coins – money divides – and that’s the truth of it.